2 1. What are Physiotherapists Doing to Address Return to Work? 3 2. Why Should Physiotherapists be Involved? 4 3. Is it within my Scope of Practice? 6 5. What are the Occupational Health Guidelines for the Management of Low Back Pain? 7 6. What are Blue Flags? 8 7. How can I Screen for Blue Flags? Returning to work after an injury is a very challenging, and sometimes scary, time for many patients. Physiotherapists are in a unique position compared to other health care providers to help patients not only recover from an injury through hands-on care and exercise, but also have the opportunity to engage, encourage, and educate them. But do enough therapists take advantage of this opportunity? 1. 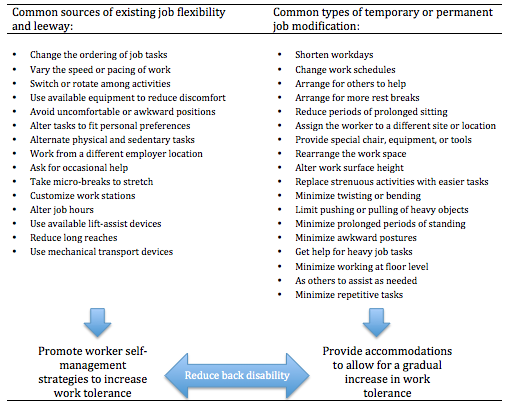 What are Physiotherapists Doing to Address Return to Work? To date, advising patients about returning to work has primarily been the focus of physiotherapists who are members of ACPOHE (Association of Chartered Physiotherapists in Occupational Health and Ergonomics). Moore reported that NHS outpatient physiotherapists do not routinely address work issues. The Work Foundation (UK) says health care professionals should consider the impact of musculoskeletal disorders on individuals ability to stay in and return to work. 2. Why Should Physiotherapists be Involved? Helping someone to remain in or return to work is an important part of the recovery process. 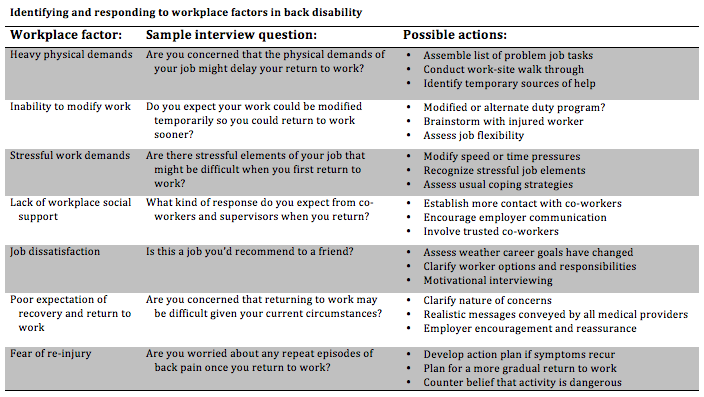 Physiotherapists have a duty of care to discuss return to work strategies with their patients. 3. Is it within my Scope of Practice? The CSP endorses consideration of work outcomes by all physiotherapists. Even simple efforts to identify and discuss work issues with patients can lead to better work outcomes. The Allied Health Federation has now produced an Advisory Fitness for Work Report, which may be used by all physiotherapists. Physiotherapists can help GPs tackle sickness absence. The evidence is strongly in support of the notion that work is good for physical and mental health. The converse also appears to be true, when remaining out of work. The International Occupational Health guidelines for the management of low back pain, including those of the UK, are also in agreement that remaining at work or an early return to work, with modified duties if appropriate, should be both supported and encouraged. Early intervention is recommended in conjunction with addressing the misconception that the worker needs to be pain-free before returning to work. Helping someone to remain in or return to work is an important part of the recovery process. The Department of Work and Pensions (DWP) maintain that not only are health professionals in a unique position to provide advice about work, but that crucially they also have a duty of care to discuss strategies for returning to work with their patients. This short YouTube clip gives a lighthearted view of how Rod Stickman returned to work, very successfully. 5. What are the Occupational Health Guidelines for the Management of Low Back Pain? Focus on obstacles to recovery and return to work. Anything about the person, workplace or circumstances that stand in the way of early return to work is an OBSTACLE! 6. What are Blue Flags? Kendall, Linton and Main coined the term “yellow flags“ to describe a set of identifiable psychosocial risk factors for prolonged disability, which included catastrophizing fears about pain or injury and unhelpful beliefs about recovery. More recently, these “yellow flags“ have been applied specifically to occupational contexts and have been termed ”blue flags”. Although these elements are viewed as predictors of outcome, the evidence suggests they do not have equal measure. Much of the evidence from systematic reviews have pointed towards workers low expectations about recovery or returning to work as having the strongest predictive evidence. Listen to this Radio 4 program broadcast in April 2013. Can you identify any blue flags from the discussion? 7. How can I Screen for Blue Flags? Gray et al undertook a systematic review of instruments for the assessment of blue flags in individuals with non-specific low back pain. They found that none of the instruments, which were predominately questionnaire based, could be recommended for use in clinical practice. The exception to this was the Obstacles to Return to Work Questionnaire (ORTWQ). The ORTWQ is a valid measure of blue flags(1). Disadvantage: Time-consuming to complete(1) (it takes around 20 minutes). Back pain is often not caused directly by work, although some situations at work may exacerbate symptoms. If managed appropriately, time off work is often not needed. Work in a well-managed environment can support recovery. You do not have to be 100% pain-free before return to work can be considered. Reassure patient that pain does not mean that work and activity are harmful. Tell patients that staying active and at work helps people recover more quickly. At 4-12 weeks provide the worker who has not returned to work with an active rehab program. This should consist of education, reassurance, exercise and pain management according to behavioural principles. As a physiotherapist, give functional activities as exercises that simulate work demands. 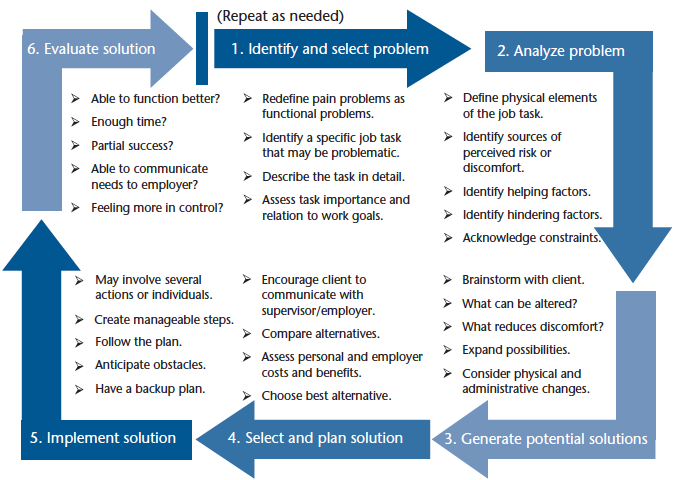 Explore with the patient what they see as a reasonable plan for return to work. How confident are you about being able to return to work? What do you think is preventing you from returning? What might help you to return to work? Outline a time frame and plan together for returning. Encourage an incremental increase in activity levels. Focus on what the patient is able to do, NOT what they can’t. Consider modifications to work and /or phased return. Early return to work (RTW) can be helped by simple modifications to a person’s job. Mostly this will be seen as a temporary measure. Altering physical demands by reducing heavy loads/limiting overreaching. Reducing pace of work/take additional micro-breaks. Avoid static positioning/vary tasks/limit repetition. Successful RTW can only be achieved if all those involved in the process are communicating and expressing the same things. This includes the person, the GP, and the employer. Conflicting advice can prolong sickness absence. Try to be proactive and outline to the GP your recommendations for RTW. Consider a direct discussion with the employer. Remember you will need your patient’s informed consent. ↑ Moore (2011). Physios have been helping workers to avoid slipping from sick leave into long-term disability. CSP Frontline. ↑ Zheltoukhova K, O'Dea L, Bevan S. Taking the strain: The impact of Musculoskeletal Disorders on work and home life. Fit For Work UK. December 2012. ↑ 3.0 3.1 Dame Carol Black (2008). Working for a healthier tomorrow. Department of Work and Pensions. London, UK: TSO. ↑ 4.0 4.1 Department for Work and Pensions (2013). Advising Patients about Work. : An evidence-based approach for General Practitioners and other healthcare professionals. London, UK: TSO. ↑ Eaton L (2013). Business as usual. CSP Frontline. ↑ Costa-Black KM, Loisel P, Anema JR, Pransky G. Back pain and work. Best Pract Res Clin Rheumatol, 2010. 24(2): 227-40. ↑ Allied Health Professions Advisory. Fitness for Work Report. ↑ Browning S. How physios can help GPs tackle sickness absence. Fit UK Blog (May 2013). ↑ Dame Carol Black. ABC Radio National Life Matters Podcast (May 2012). ↑ Waddell G, Burton AK (2006). Is work good for your health and well-being? London, UK: TSO. ↑ 12.0 12.1 Staal J, Hlobil H, van Tulder MW, Waddell G, Burton A, Koes B, van Mechelen W (2003). Occupational health guidelines for the management of low back pain: an international comparison. Occupational Environmental Medicine, 60(9): 618-626. ↑ Kendall et al (1997) Guide to assessing psychosocial yellow flags in acute low back pain: Risk factors for long-term disability and work loss, Wellington: NZ. Accident Rehabilitation and Compensation Insurance Corporation of New Zealand and the National Health Committee. ↑ Main CJ, Sullivan MJ, Watson PJ (2008). Pain Management: Practical Applications of the Biopsychosocial Perspective in Clinical and Occupational Settings. London, UK: Churchill Livingstone. ↑ 15.0 15.1 Shaw WS, van der Windt DA, Main CJ, Loisel P, Linton SJ. Early patient screening and intervention to address individual-level occupational factors (“Blue Flags”) in back disability.Journal of Occupational Rehabilitation, 2009; 19(1): 64-80. ↑ 16.0 16.1 16.2 Gray H, Adefolarin AT, Howe TE. A systematic review of instruments for the assessment of work-related psychosocial factors (Blue Flags) in individuals with non-specific low back pain. Manual Therapy, 2011; 16(6): 531-543. ↑ Marhold C, Linton SJ, Melin L. Identification of obstacles for chronic pain patients to return to work: Evaluation of a questionnaire. Journal of Occupational Rehabilitation, 2002; 12(2): 65-75. ↑ 18.0 18.1 Shaw WS, Main CJ, Johnston V. Addressing occupational factors in the management of low back pain: implications for physical therapist practice. Phys Ther, 2011; 91(5): 777-89.